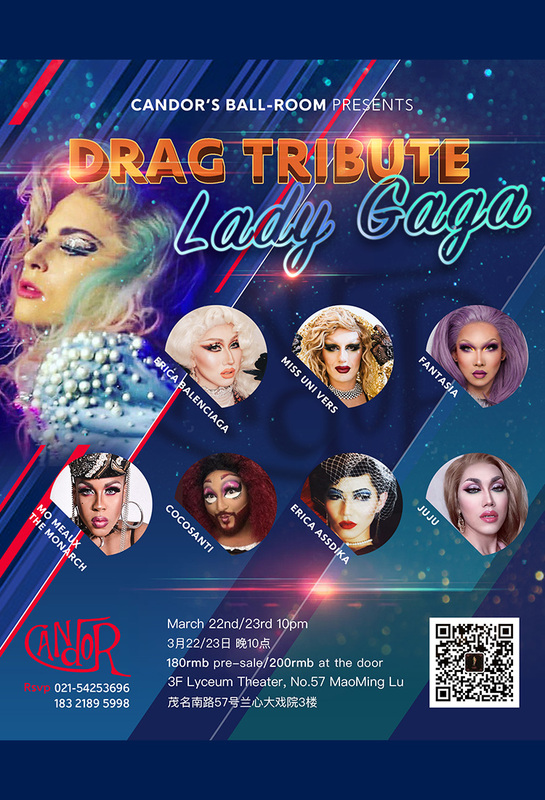 Candor’s Ballroom is proud to present “A Drag Tribute: Lady Gaga”, a salute to the Queen of Monsters. After a month long hiatus, join Shanghai’s finest Drag Queens as they honour the icon who has pushed every boundary to redefined music, fashion, and justice. Our Queens will serve you lewks (and drinks) and entertain you with an array Gaga inspired numbers. So come dressed in your finest Gaga inspired look show us the Monster you truly are, because we have prizes for finest lewk. Live for the Applause and Just Dance the night away with your favorite queens of Shanghai. Come on! Do you need a Million (more) Reasons to enjoy this show? 180rmb through SmartTicket or 200rmb at the door.